But things become a lot more complicated when Anda befriends a gold farmer - a poor Chinese kid whose avatar in the game illegally collects valuable objects and then sells them to players from developed countries with money to burn. This behavior is strictly against the rules in Coarsegold, but Anda soon comes to realize that questions of right and wrong are a lot less straightforward when a real person's real livelihood is at stake. 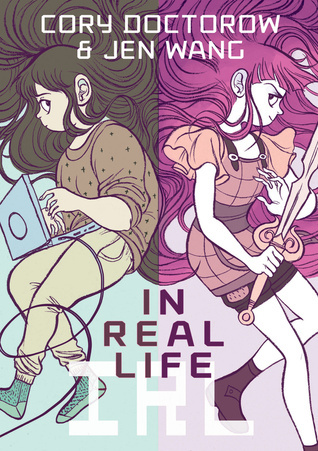 We don't often review graphic novels around here, but I really enjoyed the cover and liked the focus on a girl gamer, so I gave it a shot and was pretty pleased. First off, Jen Wang's art is absolute perfection. Her design is cartoony, but still very rooted in the real world, and I loved the character design for Anda, her family, teachers, etc., not to mention the very rich visual world she created for Coarsegold. The use of color was great, too - vibrant colors in-game, slightly duller, earthy tones for the real world. Really helped provide visual markers for what was going on where. The story is interesting but a bit heavy-handed at times. I found myself getting frustrated a lot with Anda as she very naively tried to help Raymond, a Chinese boy who is a "gold farmer", selling in-game objects for real money to gamers. As an adult, I was like, woah, girl, this is going to backfire like mad on you, stop now. But I could see a teenager who seems as idealistic and sensitive as Anda is, trying to go above and beyond to help, without really recognizing the consequences. Fortunately, there are consequences for Anda, both in the real world and online, for what she does. She means the best, but she learns a hard lesson that Raymond's problem isn't hers to solve, and that it isn't as easy as she wants it to be to fix it, anyway. Also, the fact that here's this white girl from America stepping in to tell a bunch of Chinese people that she knows how to fix their problems! she is smart and educated and knows just what to do!! and all they have to do is listen to her!!! and things will magically be better!!!! ... that was kind of off-putting. (Read this blog post about the white savior trope in films to see what I'm getting at.) For a little while, whenever Anda's plan goes lopsided, I thought, oh, okay, this book is actually showing how trying to swoop in and fix other peoples' problems without understanding the cultural context around the issue is actually a terrible idea! And then, uh, the ending happens, and I was like, wait, no, you just completely undermined the point you were trying to make. Like, it's a great cutesy happily-ever-after type ending in a story that in all honesty deserved something a little more ambiguous. I really did enjoy the read -- empowered lady gamers, heck yeah! -- and the art is spectacular, but I feel like the message maybe got a little twisted/diluted. It is definitely worth a read, but be ready for some eye rolls if you're much like me.